1st appearance: Buffy the Vampire Slayer, 1997. Skills and abilities: Trained from an early age in the use of a variety of weapons and mixed martial arts skills. Kendra Young was a Slayer born on the Caribbean island of Jamaica. Unlike Buffy she was identified as a “potential slayer” at an early age and was taken in and trained by Sam Zabuto in weapons and martial art. Kendra was the modeled slayer in training mastering the “slayer handbook” and carrying out orders to the letter. Before she received her powers she carved a stake she affectionately called “Mr. Pointy”. When Buffy Summers suffered a temporary death the slayer line and powers were activated in Kendra in 1997. Investigating a supposedly “slayer-less” hellmouth she fought Buffy and later allied with the Scooby Gang in battling the vampires Spike and Drusilla. After Angel was reverted to “Angelus” she returns to sunny dale to aid her friends but is killed in battle with Drusilla in 1998. after only a year-long tenure as Slayer. Her death activated “Faith”. 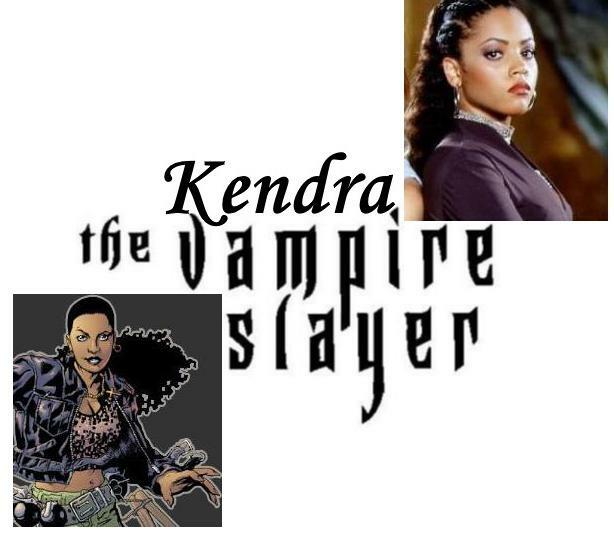 Note: Kendra appeared in season two of the television series Buffy the Vampire Slayer and was portrayed by Bianca Lawson.